It’s been a cool and cloudy day out today. I took Mom and Dad over to a med Center Store, dad needed a new walker and a couple of items and back home. Been sort of a long day. My best friend, who’s more like a brother to me, is awaiting the results of blood work. It looks as though he may have Cancer. I’m hoping and praying for the best, we’ve been through a lot together. 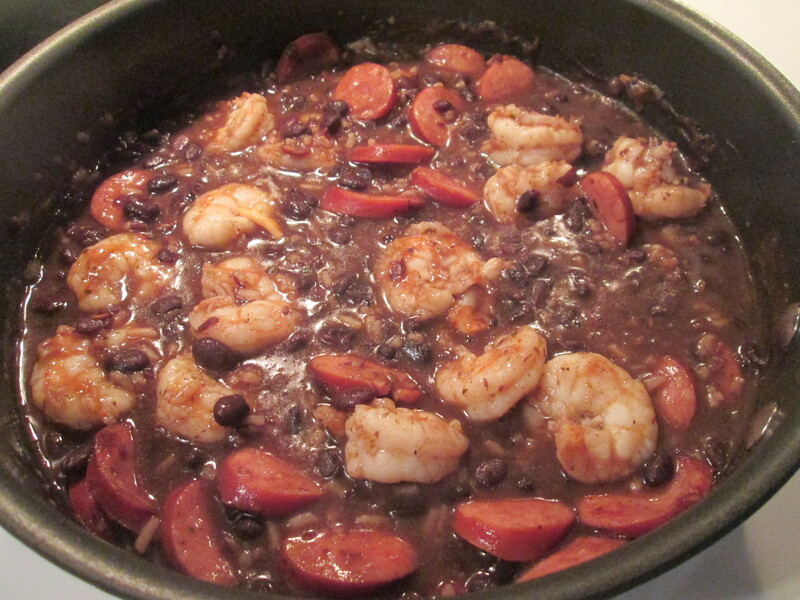 For dinner tonight I prepared Shrimp and Andouille Sausage w/ Grandma Maud’s Premium Black Beans and Rice and Cornbread. 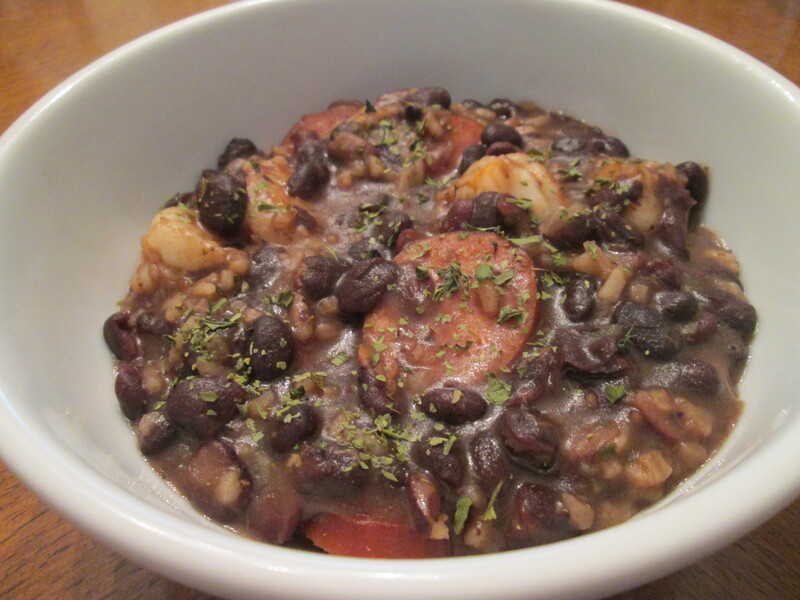 Shrimp, Andouille Sausage, and Red Beans and Rice – You know it has to be one of those lip smacking delicious dishes! I had a bag of Grandma Maud’s Premium Black Beans and Rice Bean Meal in the pantry and as I was looking around for something for dinner that just sounded right! 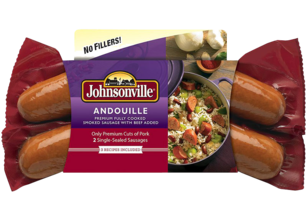 I also used a bag of Kroger Jumbo Shrimp and Johnsonville Andouille Sausage. I started by slicing the Andouille Sausage into 1″ slices. Then in a medium skillet I cooked the Sausage till it was browned on both sides and sat aside till a bit later. As my Sausage was getting done I boiled some water for my Shrimp. I didn’t boil the Shrimp until it was time to add to the Black Beans and Rice. To prepare the Black Beans and Rice just boil your water, add your mix, boil and simmer for about 30 minutes and your done, stirring often. After 20 minutes of cook time I added the Andouille Sausage, then after 25 minutes of cook time I added my Shrimp. Oh the aroma, that alone makes your mouth water! To serve it I used a bowl, sprinkled some Cilantro on it and a few shakes of the Frank’s Red Hot Sauce. Then Enjoy! So, So, Good. I love the Grandma Products, so easily prepared and just flat-out delicious. Not to mention the addition of the Shrimp and Sausage. 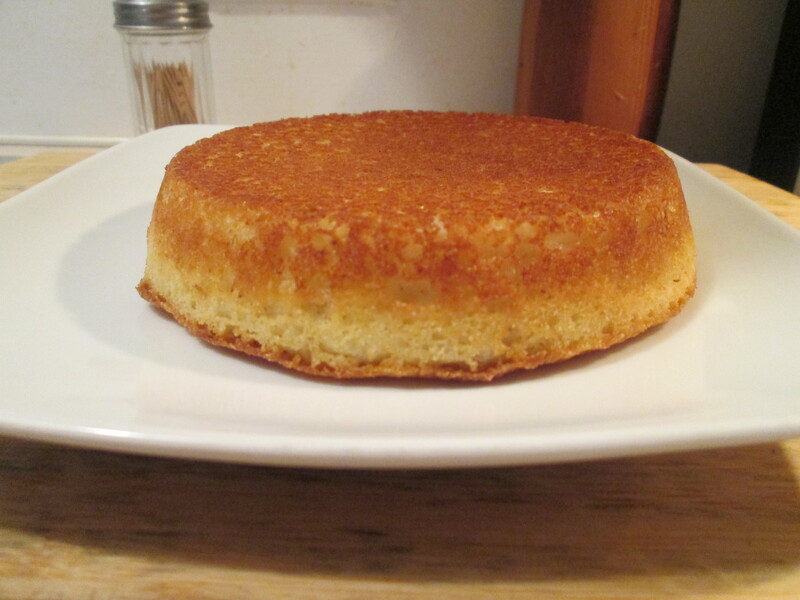 I also made a small Cast iron Skillet of Cornbread. As always I used Martha White Corn Meal Mix. For dessert later a bowl of Breyer’s Carb Smart Chocolate Ice Cream. 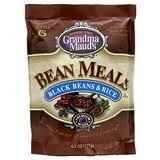 Grandma Maud’s Premium Bean Meals are loaded with wholesome flavors to serve as entrees or side dishes. These premium delicacies replicate the flavor profile of “it’s been cooked on the stove all day” dishes in minutes. Beans are a miracle food containing lots of protein which makes it one of nature’s perfect sources of strength, stamina and health. What we did was give you that perfect source of protein in a short time while keeping a delicious flavor with one of the lowest sodium counts for a product of this kind and without adding meat. Our Black Bean and Rice has the lowest sodium count for products of its kind and it’s still delicious! Precooked Dehydrated Black Beans, Precooked Long Grain Enriched Rice (Rice, Niacin, Iron, Thiamine and Folic Acid), Maltodextrin, Dehydrated Onion, Sugar, Dehydrated Potato Flakes, Salt, Less than 2% of Modified Food Starch, Hydrolyzed Corn Protein, Enriched Flour (Bleached Wheat Flour, Malted Barley Flour, Niacin, Reduced Iron, Thiamin Mononitrate, Riboflavin, Folic Acid), Spices, Hydrolyzed Soy and Corn Protein, Autolyzed Yeast Extract, Natural Flavor, Natural Smoke Flavor, Xanthan Gum, Guar Gum, Caramel Color, Partially Hydrogenated Soybean and Cottonseed Oil. These products are fully cooked and ready to eat out of the package or be prepared to your liking! Place sausage in a skillet. Bring to a boil; reduce heat to low. Cover and simmer for 10 minutes or until heated through, turning links once. For freshness, keep refrigerated and use by the date stamped on the package. Opened packages should be consumed within 7 days, or freeze no longer than 30 days. Pork, water and less than 2% of the following: salt, corn syrup, beef, spices, sodium phosphate, paprika, dextrose, onion powder, dehydrated garlic, sodium erythorbate, sodium nitrite, flavorings, collagen casings.